The Power BI team is committed to democratizing access to data and analytics to build a true data culture – an environment in which all users are empowered to make better decisions with data. 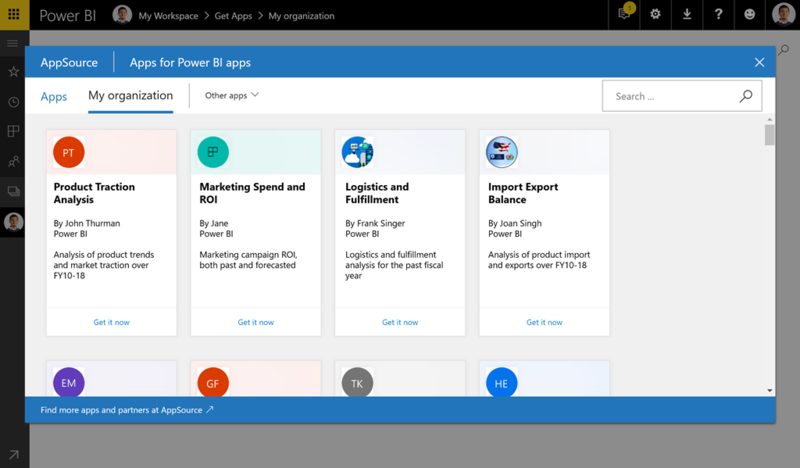 To bring that vision to life, Power BI is equipped with a suite of features powered by cutting-edge Artificial Intelligence (AI). Our Q&A feature enables users to ask questions of their data in natural language. Quick insights and the recently released data-point focused insights feature allow users of all skill levels to bring the power of AI to bear on their data decisions. Today, we are excited to announce the next step on our journey. Going forward, Power BI will leverage the power of AI to suggest interesting and relevant content to your end users. Here’s when the magic starts. Prior to this, you would see the list of apps in AppSource that you had access to, sorted alphabetically. Now, through the power of AI, that same list of apps will be ranked in order of how relevant they are to you. The top apps may very well be critical intelligence that was made available to you, but which you were not yet aware of. These suggestions are powered by a sophisticated model that takes into account a variety of factors, including the overall popularity of the app, and the actions of other users in your organization, and your relationship with those users. Of course, we’ll be tuning and constantly improving this model as time goes on. If you see an app that you’re interested in, simply select “get it now” – the app and all of its contents will automatically be made available to you, allowing you to instantly gain valuable insights from the dashboards, reports and workbooks contained within. The Power BI team firmly believes in building data cultures that are responsible and secure. As a result, this feature, like the app browser that preceded it, only suggests content to end users if they have been granted access to that content by the author. 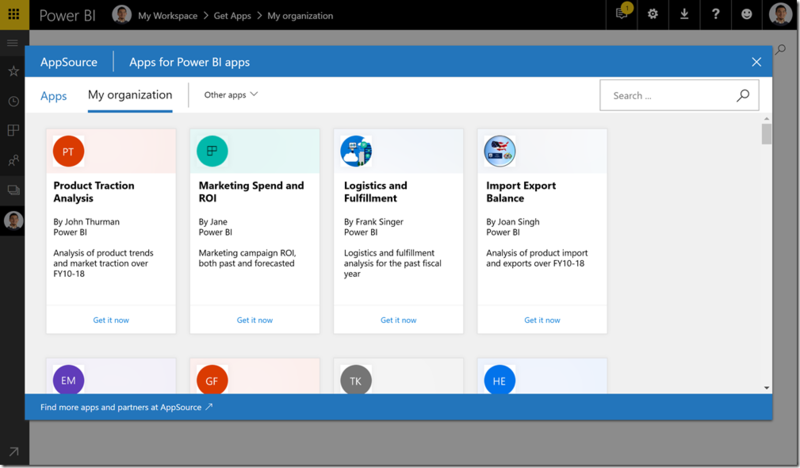 In addition, thanks to the Office 365 audit logs, the tenant administrator can receive a 360-degree view of Power BI activity in their organization, including all app installations and views of content. We believe that this feature will further accelerate the rate at which effective data culture is able to grow in an organization. But this is only the beginning. Stay tuned to see how we will continue to leverage AI to deliver the right insights to the right people at the right time. Have comments, feedback, or ideas for next steps? We’d love to hear from you. You can vote on new feature ideas, or leave a comment below, or in the forums.